A drum series 10 years in the making. Pearl’s 70 years of drum craftsmanship culminate with the kit you’re ready to step up to. With 5.4 mm maple shells, pro-level features, and gorgeous lacquer finishes, Decade elevates your performance at a price that was previously thought impossible. Decade’s 6-ply/5.4 mm all maple shell is what sets it apart from the other players in the field. 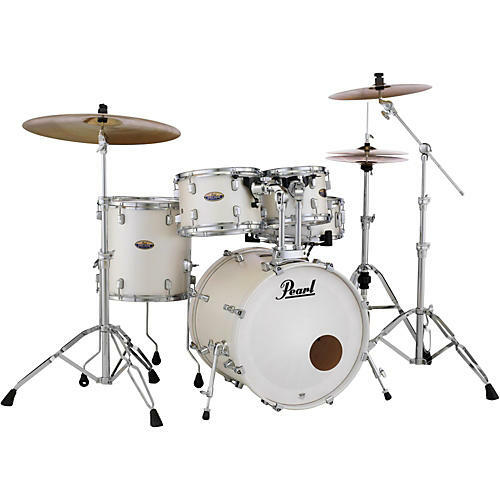 The final product of ten years of process and material refinement, each cross-laminated ply incorporates Pearl’s proprietary Superior Shell Technology. Finally, the plies are formed in high-temperature molds with 1,000 PSI of hydraulic pressure to produce perfect drum shells that exhibit superior tone, optimal resonance and extreme strength. The resulting thin (but powerfully strong) shell reacts quickly to the stroke, producing beautifully resonant highs and thundering lows. Your wait for quality, affordable maple drums is over. Order today. Floor Tom(s): 14 x 14 in.